The Federal Motor Carrier Safety Administration (FMCSA) will soon release its plan to overhaul the Compliance, Safety, Accountability (CSA) scoring system, the agency’s chief of enforcement announced on January 9. Upgrading the CSA Safety Measurement System (SMS) will be a multi-year process, said Joe DeLorenzo, director of FMCSA's Office of Compliance and Enforcement, speaking at the 2018 Annual Meeting of the Transportation Research Board in Washington, D.C. The revision plan is overdue; Congress asked the FMCSA to have it done by December 5th. It’s expected to describe how the agency will implement recommendations issued last year by the National Academy of Sciences (NAS). Among the recommendations are better data collection and use of a new statistical model known as Item Response Theory (IRT), which is sometimes used to grade hospitals and schools but has never been used in the transportation sector, DeLorenzo said. Fed the right data, the IRT model can be used to assess a motor carrier’s overall “safety culture,” he said. The IRT model incorporates many of the existing elements of the SMS but is more transparent and — like the SMS — can be used to monitor and identify carriers for interventions, DeLorenzo said. DeLorenzo cited speeding as a good example of that. In developing the SMS, FMCSA experts reached the common-sense conclusion that the faster a driver speeds, the greater the risk of a crash. Thus, the higher the speed, the more points get assigned to the violation in the SMS. When a sampling of speeding violations was run through the IRT model, however, the conclusion was much different. The model predicted that speeds of 6-10 mph over the limit result in greater crash risk than speeding by 15 mph or more, DeLorenzo said. Making the IRT model successful requires good data. The CSA scoring system has long been criticized for relying on faulty data, and one key area of improvement will be data on carrier exposure to risk, DeLorenzo said. The agency expects to work with industry, enforcement agencies, the NAS, and many others over coming years to improve data quality, DeLorenzo noted. 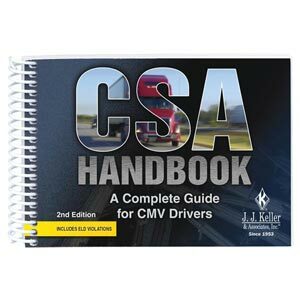 This article was written by Daren Hansen of J. J. Keller & Associates, Inc.
J. J. Keller's CSA Handbook: A Complete Guide for CMV Drivers covers all information CMV interstate truck and bus drivers need to operate successfully under CSA.